The current state of the Horseshoe Two, Wallow and other fires devastating Arizona, is a reminder to be appreciative of the beauty that surrounds us, which is fragile and fleeting. was officially closed, which includes the Catalina Mountains shown in the background of this photo. Between the extremely dry air conditions and the carelessness of people with their cigarettes and campfires (all the current fires were man-made), the danger is just too high, so they’ve closed it all down until the extreme fire danger has passed. And now, those same irresponsible individuals may legally use fireworks, as a new law this year has opened the door to their sale and use. Just yesterday local firefighters had to squelch a small fire started by fireworks. Why, in such a dry state this law passed is beyond me. Image copyrighted. Use of any kind requires licensing from Martha Lochert. 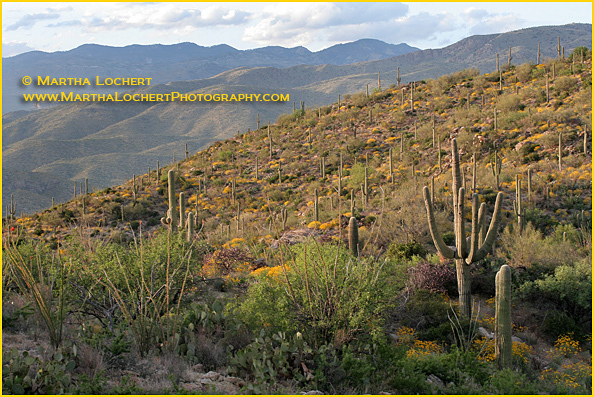 This entry was posted in color photography, landscapes and tagged Catalina Mountains, Coronado National Forest, Douglas Spring Trail, landscape photography, Rincon Mountains, Saguaro Cactus, Sonoran Desert, wildflowers. Bookmark the permalink.